The FAQ Guide is designed to provide the laser machinery owner with answers to questions that arise during the ownership of laser machines. Bell Laser provides spare parts for its laser machines and most competitor machinery and can also provide retrofits and upgrades as needed. My laser is not firing but my machine performs motion. 1. Test fire the laser from the machine's touchpanel. Also, check the touchpanel to determine if the laser power level has been reduced. If the laser fires then there is an issue with the pattern file so check its setting. 2. Check for a beam alignment issue. Test fire the laser using the machine's touch panel. Setup an object to receive the laser power, upstream from the mirror. Test with each mirror and adjust the beam alignment as required. Clean dirty optics or replace bad or questionable optics. 3. Open the laser tube lid and check the glass tube or metal tube. If the glass tube illuminates then the laser is operational. Check beam alignment. If the glass tube is not illuminating then unplug the machine, wait for ten minutes, then inspect for fractures. If no fractures, then it can be a bad laser power supply. Usually, the laser tube goes bad over time, and will not abruptly stop working. 4. Consider purchasing a laser power meter to check laser power. My laser power seems low. 1. Clean the focus lens or replace if cracked. Note, cleaning the lens frequently will alleviate risk of cracking caused by particle buildup and heating. Be sure to clean with Q-tips, ethanol, and light strokes so the anti-reflection coating is not abraded away. 2. Clean mirrors. It is best to use lens tissue and acetone and pull the wet lens tissue across the mirror. Cotton swabs can be used as a substitute but be careful not to rub too hard and do not leave wipe marks. 3. Check the touchpad to make sure the laser power is set to 100%. A lower setting decreases laser power. 4. Using a thick piece of acrylic, place before the final mirror and do a mode burn. A mode burn is an unfocused beam burn into an acrylic block. This will show the shape of the laser beam. Be careful during this process because the acrylic will flame up. However, leave the power on long enough to burn into the acrylic but not through. Check the beam, it should be gaussian in shape, or more simply stated, look like a small hill. If the laser mode is other than this shape then the gas in the laser tube has broken down and it will need to be replaced as it does not focus properly. 5. The power supply may be going bad and no longer puts out the required voltage to energize the laser. Replace the laser power supply. Be very careful around this device as it has extreme high voltage and its capacitors must be discharged (10 minute wait) after unplugging the machine. 6. Examine the chiller temperature. 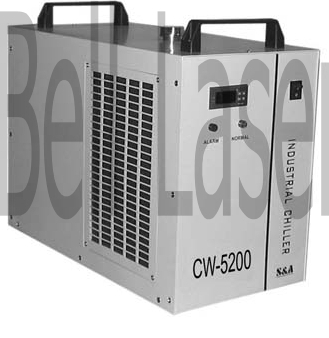 For 80 watt CO2 lasers and higher that operate in a warm environment, the chiller should be sized to handle the heat load. Temperatures above 75 degrees F can reduce laser power. Consider replacing your chiller if it is too small, or move the laser machine into an environmentally controlled room. 7. Consider purchasing a laser power meter to check laser power. 1. PVC or polyvinyl chloride is not recommended to be laser cut because it releases an acid named HCL or hydrochloric acid. The acid is bad for the machine and the operator's health. If you choose to laser process PVC, then make sure you have a filtration system equipped with activated carbon to neutralize the acid. 2. Teflon should not be laser processed because it releases a deadly gas. Never cut teflon on the laser machine. 3. If you do not know the content of a material, then request the MSDS, Material Safety Data Sheet, from the supplier. Check the Fire section of the MSDS and this will give insight to how to handle the fumes released when laser processing. 4. Purchase a filtration system with a prefilter, HEPA filter, and activated carbon. It is a good precaution for safety in laser operation. I want to improve my laser cutting or engraving quality. 1. Add a nozzle and pressurized air to direct air in line with the laser beam. This will prevent smoke and particulates from recasting on the top or underside of the material. 2. Increase laser power. Purchase a larger laser with matching power supply. 3. Purchase better quality optics. Often, low quality optics do not provide good focus or reflection. 4. Expand the laser beam prior to focus. Expanding the laser beam will create a smaller focused spot at the material. 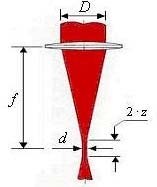 Purchase optics to expand and or expand and collimate the beam. (a collimator straightens the laser waves for better focusing). 5. Check beam alignment in the four corners of the machine. Align as required. 6. Permit the laser to warm up before laser engraving or cutting. Often, a five minute time frame is needed for the laser to warm up. See the graphs below as an example. 7. Identify is a gas assist will improve the process. Nitrogen gas reduced burning and charring in wood. Argon gas provides softer cuts in polymers like intimate apparel fabric. Higher pressure compressed air will reduce charring in wood. 8. Change the focus location. Focus can be set for the top of the material, the middle, and the bottom of the material. 9. Change laser lenses. A smaller spot size will increase power density, but the tradeoff is that the material must remain very flat or in focus during engraving or cutting. Increase the focal length to get a straighter cut and faster cutting in thick materials because the smaller focal length lens is unfocused and hogs out a much larger amount of the material to perform cutting. 10. Check your laser machines controller power settings to match your laser power output. Bell Laser uses a compensation chart to accomodate for differences in percentage of power to get a straight line slope for adjustment. Often, low cost laser machines are not properly setup for power compensation, so the percentage of power programmed doesn't match output power. Use a power meter to test and adjust as needed. 11. Upgrade your controller for power compensation while cutting. This will reduce power in curves while cutting so the same laser cut quality is throughout the material. 12. Upgrade your laser machine to have an improved mechanical drive. A ball screw driven laser machine will have smooth motion and gain finer accuracy on curves for smoother edges in thick acrylic. 13. 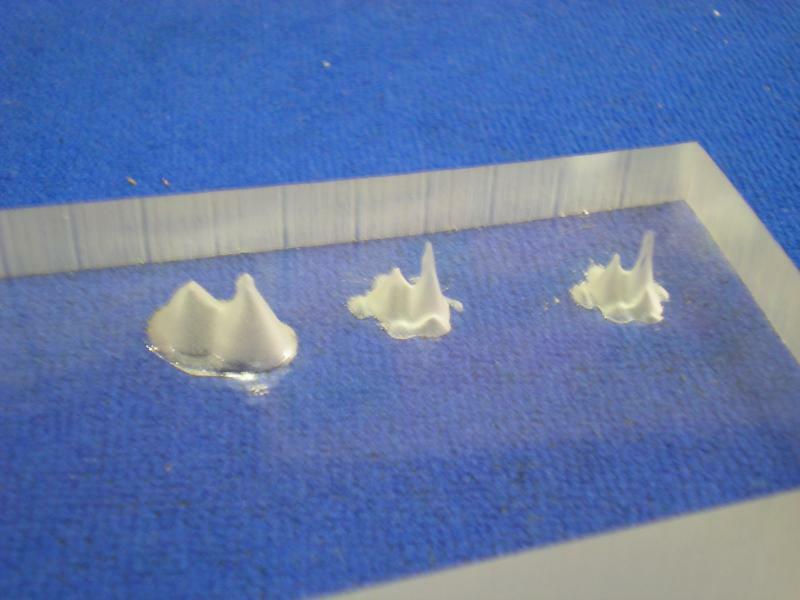 Change your material to one that works especially well for the wavelength of the laser being used. For example, some plastics work better at 9.3 microns than 10.6 microns. Also, some wood manufacturers offer aircraft grade plywood that is better for the laser, as also do plastics manufacturers. I have a repetitive job and it runs too slow. 1a. Often, dxf files are not optimized. Reduce the point count, or number of points per inch in the saved drawing. This reduction will cause less processing time for the controller. 1b. Round your corners. Reduce acceleration times by rounding the corners so that the laser machine is not required to stop, but merely reduces speed. 2. Reduce time between parts. 2a. Make a fixture to hold the part for fast changeover. 2b. Set the controller to go to a park position after completing the job so the operator can quickly unload and reload the part. 3. Use the best focus lens for the job. If the material is thick, then use a longer focal length lens. If the material is thin, or small and can be laid flat for engraving, then use a smaller focal length lens. This will increase power density and enable you to increase the speed. 4. Do a beam alignment and clean the optics. Dirty optics decrease power. A misaligned beam can decrease power by reflection inside the nozzle. 5. Spend time to adjust the air pressure or gas pressure. With this adjustment, it may be possible to increase the laser speed setting and get the quality required. 6. If the laser beam delivery is the limiting factor, rather than laser power, then change laser machines to a galvanometer, or mirror based beam delivery. The mirrors move at speeds to 3 meters per second. 1. Laser cutting thin metals can be accomplished with lasers powered over 100 watts. Increase your laser tube and power supply if required. Consider a RF metal tube laser over a glass tube laser if it is in the budget. 2. Increase the power density of the laser spot at the focus point. This can be accomplished by increasing the unfocused beam size prior to the focus lens by using a beam expander optic. Also, try using a smaller focal length lens, if it matches the metal thickness. Switch to higher quality optics. 3. Upgrade to a better beam delivery head with a high pressure gas assist and small diameter nozzle. 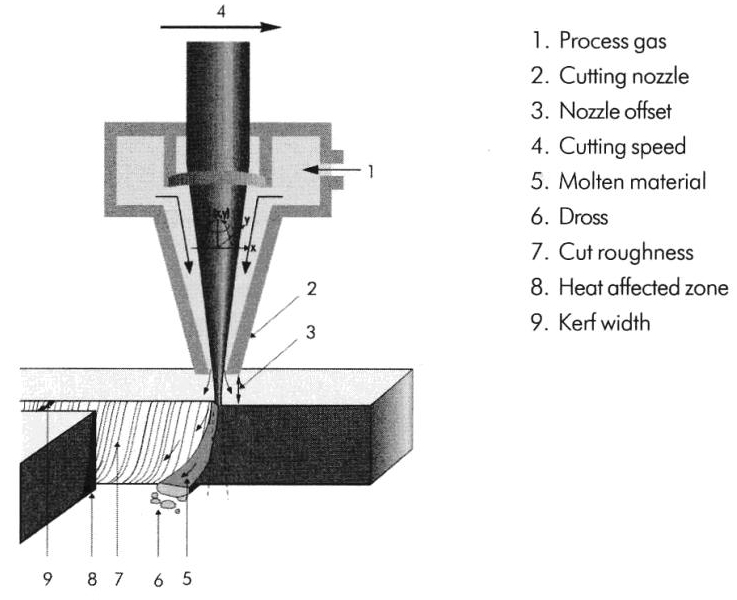 The small diameter nozzle will increase the gas pressure at the metal and improve material removal during cutting. 4. Add oxygen or nitrogen to assist cutting. For mild steel, otherwise known as carbon steel, oxygen will assist in cutting, though provide a rougher edge. High pressure compressed air may do the trick. Nitrogen will give the best quality, but slowest cut and thinner material cut. Why can't I cut Gold or Silver with my CO2 Laser? All materials absorb electromagnetic energy differently. Gold and silver relfect CO2 laser light because of its wavelength. Gold and silver absorb electromagnetic (laser) energy much better at a lower wavelength. 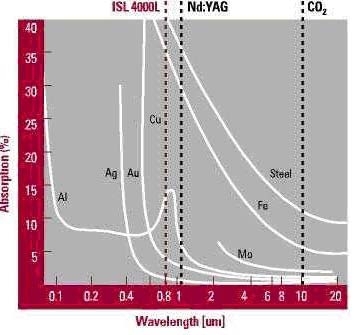 See the chart on the right.. See the common metals wavelength absorption curves to the right. Traditionally, gold and silver mirrors were used in CO2 lasers. Attempting to cut these materials will result in reflection back up to the focus lens, through the mirrors, and into the laser tube, possible resulting in optics damage. Brass will provide the same result. Rowmark is a manufacturer of Flexibrass and other metal look-alike products that are plastic. These materials, including gold plastic and silver plastic are good substitutes to achieve the same effect with a CO2 laser. But, just like the black colored street gets very hot in the summertime due to its absorption, and a white or silver roof will reflect energy and keep a home cooler, colored materials can assist in laser cutting. Black carbon films placed on sheet metal will assist in initiating a laser cut and offset the reflective property. I need better quality for my laser cutting and engraving. 1. Perform a beam alignment and check all corners of the laser machine. Clean all optics and replace any bad optics. 2. Select the correct focal length lens for the job. Different lenses are designed for different thicknesses and sizes of materials. 3. Set the air pressure properly. 4. If the quality issue is related to a heat affected zone (HAZ) then consider using a better focus lens and smaller nozzle orifice and higher air pressure. Also consider using a gas like nitrogen for assist gas. This can be rented from the local gas company. 5. Spend some time to dial in the correct speed and power settings. Try to setup a trial pattern, for example a number of lines, with different power settings. 6. Adjust to focus to the top, middle, or bottom of the material if being laser cut. The middle is good for cutting to get a straight edge. 7. If your machine permits, adjust the standoff nozzle distance from the material, as this affects cut quality. 8. Consider adding a sacrificial layer to your cut table, if back reflection is an issue. For example, some laser operators use cardboard. Also, polystyrene is a good sacrificial table for laser cutting and can be found as an inexpensive part for overlight lights. 9. If recast material on the top surface is an issue, then consider covering the material during laser cutting. Wet newspaper is good for plastics. 10. Additional factors that affect cut quality are other laser settings, including points per inch. Advanced laser settings include resetting the laser frequency from 20000 to 5000 Hz. 11. If the quality looks good at the straight line cuts but bad in the corners, consider changing the acceleration ramps and laser power in corners. There is typically a table in the controller to set these values. If these values are not setup in your controller, it is recommended that they get set. 12. Reduce or stop the mode changing in your laser machine. A simplified definition of the mode is that it is the beam shape. Add a beam expander/collimator to straighten out the beam so with a flying optic laser the beam is closer to the same mode in the closest to the furthest corner. To eliminate the mode change, add a moving XY table to your laser machine by placing on top of your current table and connecting to the motor drives (similar to connecting the rotary device). 13. If using low quality or small diameter optics, considering upgrading to better quality and larger optics. 14. Level your table to the focus head. Place a hard stop, or physical block of material under the focus nozzle and move to all four corners of the laser table as well as the center points of each of the four sides. As needed adjust and shim the table. 15. Make sure the material rests on the table in a firm and level manner and does not move or vibrate during cutting. 16. Exhaust the laser machine properly. If smoke can be seen rising in the beam path then the particulates will absorb the laser energy before it reaches the workpiece. In some cases the beam will also reflect and blossom to a larger, lesser power laser beam. My laser machine is three or more years old and it doesn't cut as well at it used to. What needs replacement? 1. Laser mirrors and focus lenses can be replaced annually. The absorption of heat energy can degrade the quality of these parts, though the degradation is not visible to the naked eye. Bell Laser sells replacement optics for all CO2 laser machines. 2. Laser tubes have their lasing gas (CO2) break down over time. Further, the electrodes discharge onto the interior glass, thus further degrading the tube's performance. Bell Laser sells all makes and models of laser tubes. Always take safety precautions when working on laser machinery. 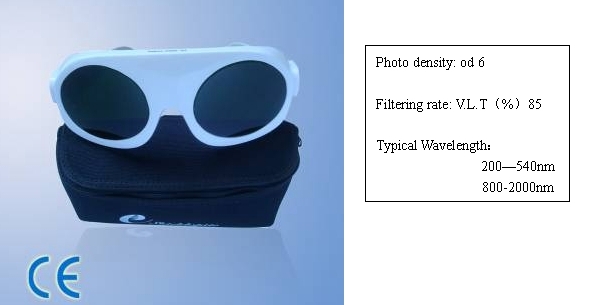 The glasses in the picture above work well for fiber/YAG/Diode laser marking machines. For CO2 lasers, common clear shop glasses with side shields provide good eye protection. This is a must for beam alignment. Also, be very careful for electrical hazards, including high voltage power supplies. These voltages are Lethal, and should be considered carefully during maintenance. For machine maintenance, it is best to power off, unplug the machine (some laser machines still have internal power even though the E-stop switch is pressed), then WAIT 10 MINUTES for the power supply to extinguish power in the capacitors. 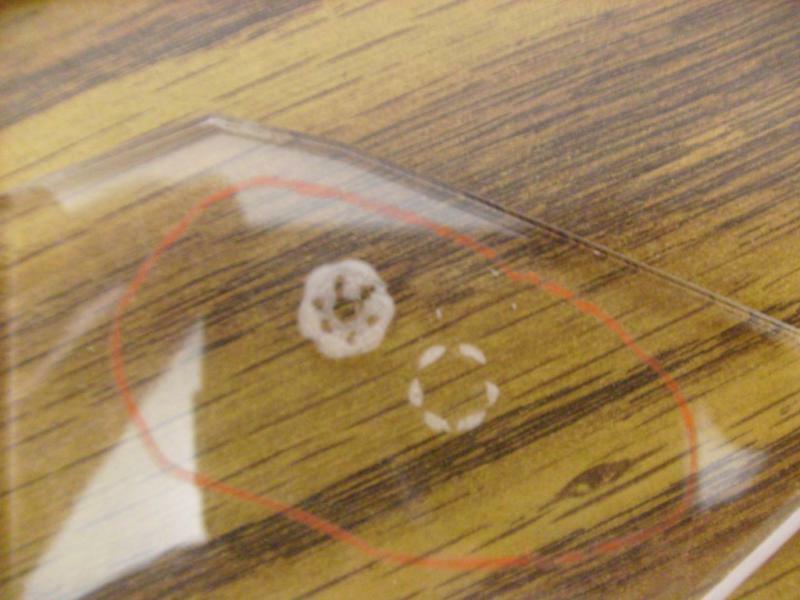 Above: Lack of Cleaning caused the particulate residue on the lens to heat, and subsequent cracking of the CO2 laser lens. It is a good idea to periodically check the lens and to learn how often cleaning is required in your laser processing operation. Above: Glass tube laser with CO2 depleted. Above: PVC Material Safety Data Sheet identifying precautions for combustion. Note HCL is released. Above: Teflon is unsafe for laser processing because it releases deadly fluorine gas. Teflon is a Dupont brand name. PTFE, polytetrafluoroethylene﻿ is the trade name. Above: High quality laser focus head assembly includes space for 1 inch diameter focus lens and assist air/gas pressure to 100 psi. Small diameter nozzle hole to 1.5 mm. Above: Increase capital D above in order to decrease the size of lower case d. The result is a smaller spot size with an increase power density. 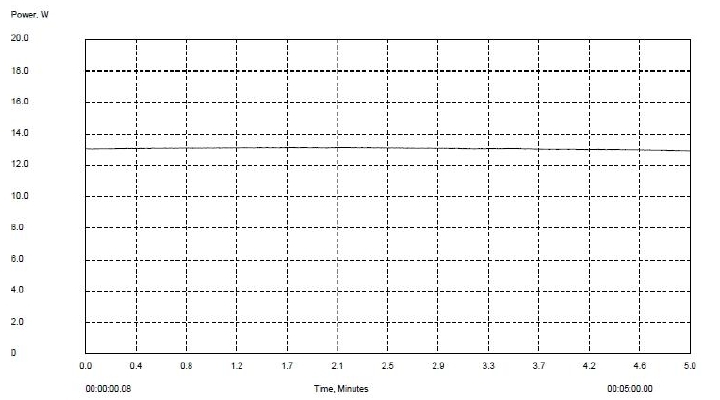 Above: Laser Power Fluctuation in First Five Minutes of a Cold Start. Above: Laser Power Steady after First Five Minutes of Operation. Above: A larger chiller equipped with cooling and heating capability can maintain a tighter temperature range. 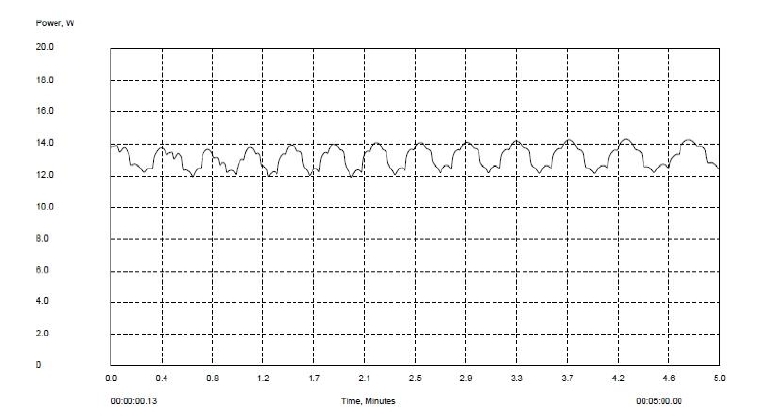 The result is less laser power fluctuation during a job or during the day's operation. Above: Laser Cutting fixture with center alignment for textiles. Ensures fast setup and accurate parts cutting. 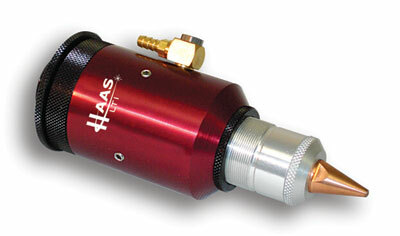 Above: Upgrade to a RF Metal Tube Laser. Above: Cutting Metal with a laser requires considering the process gas or gas to assist in the laser processing of the material. Above: CO2 laser technology costs less than YAG, so the CO2 laser is used to cut steel. Even though, steel absorbs at the YAG/Fiber/Diode laser wavelength at a much higher percentage. See Gold (Au) and Silver (Ag) in the UV, ultraviolet, laser wavelength for best absorption. Gold and silver were traditionally used as CO2 laser mirrors because they reflect rather than absorb at 10.6 micron wavelength. 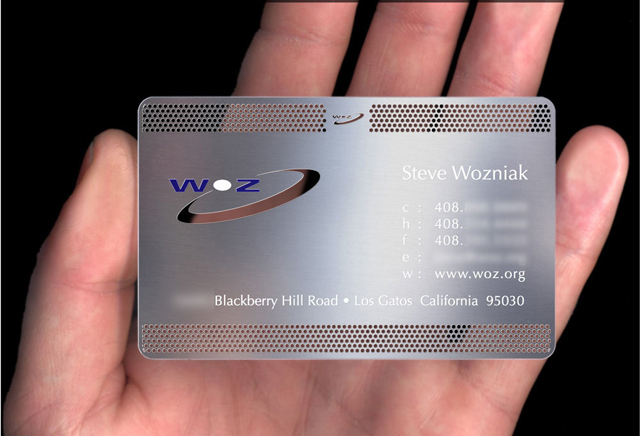 Above: Laser cut metal business card with direct printing using a solvent inkjet pritner. 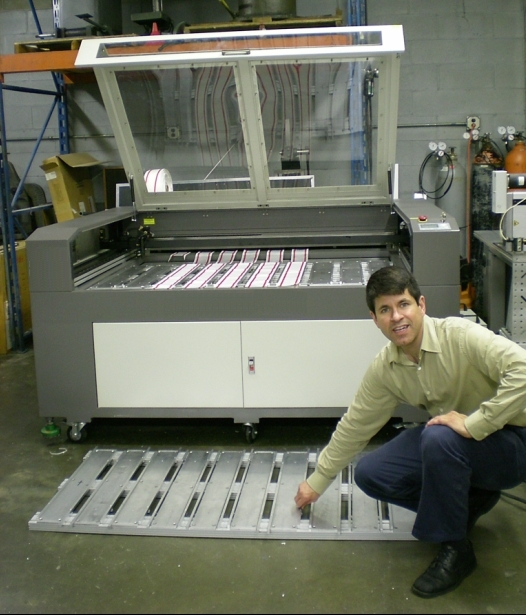 Bell Laser manufactures metal cutting laser machines and sells direct printing technology.